Skincare Sunday - Natural, Organic and Cruelty-free Products for Babies! Happy Skincare Sunday everyone! I know I usually talk about skincare for me in these posts; but, today I'm mixing it up and talking about skincare (and a little oral care) for babies! I have a 10 month old and finding good products to use on him is important to me! Elliott's skin is super sensitive and dry (similar to most babies) and to top it off, we live in an incredibly dry area, so I think it makes it worse! I'm more concerned about products and ingredients I put on his skin than I am my own! 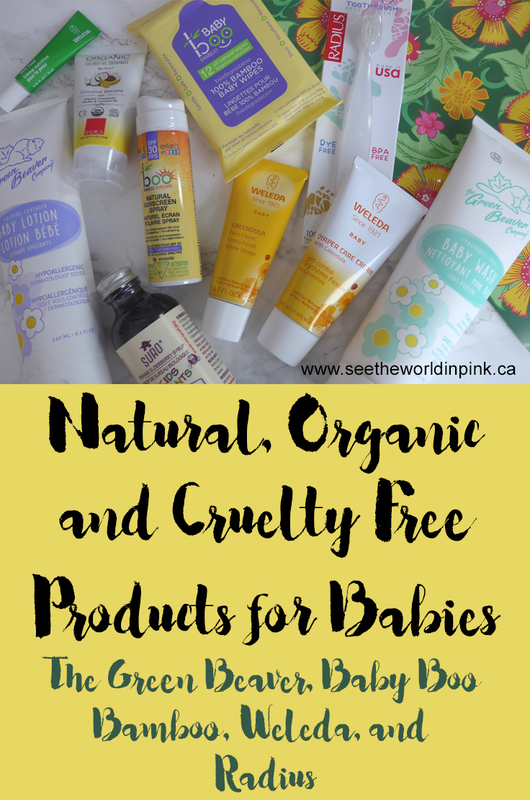 So, I was very happy to receive a lovely basket of natural, organic and cruelty-free baby products that are available at local shops or on well.ca! Green Beaver Baby Lotion Calming Lavender ~ $12.99 CAN. Ideal for delicate skin, this line has been infused with natural ingredients such as sunflower oil and chamomile extract, to help nourish, hydrate and protect skin and hair. First off, Green Beaver is a Canadian brand that is natural, organic, gluten free and non-gmo. Babies bodies have a higher surface-area to body-weight ratio putting them at a higher risk of absorbing any chemicals in to their bodies, so Green Beaver has designed a line with natural and safe ingredients for your little ones! Personally, I love this lotion - I know there is some discussion about whether or not you should use scented products on babies. For us, we love lavender lotion before bed time - I use it on myself all the time too. But, if it concerns you at wait until after 6 months or there is an unscented lotion as well! This is a great texture and works well for Elliott! Green Beaver Baby Wash Fragrance Free ~ $10.99 CAN. Ideal for delicate skin, this line has been infused with natural ingredients such as sunflower oil and chamomile extract, to help nourish, hydrate and protect skin and hair. I like that this is natural and organic and gentle on the skin. When my guy was really little I made the mistake of over-soaping him up and totally drying out his skin. Because of that I'm really conscious of what soap I am using on him and how much of it! This is great - creaming, gentle and has no scent so it's perfect for any age! Weleda Baby Calendula Face Cream ~ $16.79 CAN. Moisturize your baby’s delicate facial skin with our Calendula Face Cream. Baby and child’s delicate facial skin gets soothing protection from this lightweight baby face cream. Our Calendula Face Cream supports the natural functions of the skin and helps keep it moisturized. Weleda products are natural, organic, and non-gmo. I have never actually tried a baby specific face cream. I did notice that Elliott's face would be super dry in the middle of Winter, so this would have been great then! I will likely use this all over; but, I like that this is safe for the face too because his cheeks still get dry! Weleda Skin Food Travel Size ~ $4.29 CAN. Dry, rough skin of any age gets indulgent moisture with this intensively nourishing, deeply hydrating cream. It’s a unique, ultra-rich whole-body cream that deeply hydrates, restores and protects your skin. This isn't a baby specific product and I have heard amazing things about Skin Food for everyone's skin! This is great for really dry skin and even has slight anti-inflammatory properties. This little travel size is so perfect to throw in my diaper bag so I can use it on baby and me when I need it! Weleda Calendula Diaper Care Cream ~ $13.99 CAN. Calendula Diaper Care is great for helping get rid of your baby's diaper rash! As a natural healing alternative, choose Weleda's Diaper-Care for quick, effective relief for your baby's diaper rash and minor skin irritations. Zinc oxide protects and promotes healing, while calendula soothes the skin. I love that this diaper cream comes in a squeeze tube - it's such a pain dipping your fingers in to a pot and getting diaper cream everywhere. Also, I find this much more soothing on diaper rash than the other stuff I've been using. Elliott has been teething for the last few days so this has been much needed! It is a thin, easy to spread consistency and it cleared up diaper rash quickly! I think I will give this as a gift at baby showers it's so good! Boo Bamboo Baby & Kids Natural Sunscreen Mini Spray ~ $14.99 CAN. Boo Bamboo Baby & Kids Natural Sunscreen Spray with Bamboo Extract provides you with natural Broad Spectrum UVA/UVB protection. Boo Bamboo products are natural, cruelty free and vegan. I have tried multiple products from the brand and really liked them! I will get to use this soon - I like the little size for in the diaper bag on the go for touch ups! Last Summer I couldn't use sunscreen on Elliott as he was too little; but, he will be super busy now when the weather is good so we will need this! Boo Bamboo Baby 100% Bamboo Baby Wipes ~ $9.99 CAN for 80 wipes (12 wipes shown here). Nature’s fastest growing plant has been harnessed into a collection of gentle baby products that soothe and moisturize your baby’s sensitive skin without harsh chemicals. Boo Bamboo Biodegradable Baby Wipes are made of ultra soft, eco-friendly, 100% unbleached bamboo cloth. Safely and gently cleanses baby's face and body using the highest quality, natural and organic ingredients. I love that these are biodegradable - I can throw them in my compost which is awesome! These worked well - I even tested them as an makeup remover/face wipe because I have used baby wipes like that before! Overall, these were good! Suro Organic Elderberry Syrup for Kids ~ $15.49 CAN. Certified Organic Elderberry Syrup made with organic Canadian elderberry, extracts of elderflowers, propolis, and raw honey. Traditionally used to help fight colds and flu. Alcohol free. Especially made for kids, this syrup tastes good! Soothes sore throats, helps in case of coughing, fever. Also contains elderflower and propolis tinctures with Canadian raw honey. I haven't heard of Suro before; but, they are Canadian, natural and organic. Now, this is the only product I can't try yet as it recommend for children ages 2-14 (but, I can save it because it is good until 2020 and Suro says this is good for 2 years once it's open because of the ingredients!) This contains raw honey which kiddies shouldn't have at least until they are a year old! But, I will hold on to this and use it when Elliott is 2! Radius Pure Baby Toothbrush ~ $6.99 CAN. The RADIUS Pure Baby Toothbrush is for children ages 6-18 months. The Pure Baby is completely dye and BPA free to ensure safe brushing. The Pure Baby has 8,000 ultra soft, premium RADIUS bristles to ensure cushioned brushing. I have used a travel Radius toothbrush before and quite liked this. I do think this is a good shape and handle for babies to use! I like that it is dye free as well and we will put this to good use! *Radius Organic Children's Coconut Toothpaste ~ $12.29 CAN. Radius Organic Children’s Coconut Banana Toothpaste merges delicious ingredients straight from nature and is a refreshingly simple, low-foam toothpaste that is both safe and effective. I hope you guys were okay with a little bit of a different Skincare post today! But, I know as a mom there is a lot of options out there so it's nice to know some safe brands and products that work! Also, these brands are all really good options for showers or gifts because you know you are giving natural, organic and gentle products for a new little one! *PR products featured - all opinions are my own. This post contains affiliate links. I cannot believe your son in 10 months now! I feel like you just gave birth! He is 11 months old on Friday too - I feel the same way, the time has just flown by!